New York/CMM….Team Jamaica Bickle, held its inaugural reception and awards at the Embassy of Jamaica in Washington D.C. on Wednesday, April 6, 2016. This was the organization’s second foray into the District of Columbia, Maryland, Virginia (DMV) area, having hosted a brunch at the Jerk Pit Restaurant in 2015. The event served several purposes, chief of which is to expand the organization’s footprint but more importantly secure meaningful, productive alliances in that community. The Mid-Atlantic region (particularly the DMV) area is particularly important to this growing network as it is home to a large cross-section of Caribbean nationals. The fact that this is where the seat of power resides, being the nation’s capital; and that it is home to the Jamaican Embassy, makes the partnerships being forged, even more meaningful. Leading the charge in the DMV area on behalf of the organization is Michael Campbell, an ardent supporter of Team Jamaica Bickle. Mr. Campbell is also a Commissioner on the Mayor’s Advisory Commission of Caribbean Community Affairs in Washington, D.C.
“I am extremely pleased to be spearheading this movement with Mr. Clare,” he declared. “Team Jamaica Bickle’s outstanding contribution to the athletes and the nation demands not only my support but that of Diasporans state side.” He encourages everyone to embrace the vision in the interest of the athletes. The Awards reception honored some notable Caribbean-Americans. It also served as a fundraiser. TJB relies solely on donations to keep its operations going. His Excellency, Ambassador Ralph Thomas in his remarks commended the organization for its visionary leadership which has seen Jamaica’s presence at the relays solidified to include the Jamaican Flag being flown at Franklin Field since 1999; the first for a foreign nation. He lauded the remarkable nature of the organization’s Hospitality Initiative which provides warm meals, transportation, assistance with accommodation and chiropractic care for the athletes during these relays, noting that Jamaican athletes were not the only beneficiaries but that other Caribbean athletes from Trinidad and Tobago, Grenada, and St. Vincent and the Grenadines among others were all included in this grand gesture. He encouraged the gathering to give generously to this worthy cause. For his part, Irwine Clare, Snr., the organization’s founder appealed for financial support noting that the vast services provided come at a significant cost. He emphasized the value of that support to all, stating that when the athletes do well, it impacts the country and citizens everywhere, positively. He reinforced TJB’s commitment to the athletes and reiterated the expansion into the DMV area as a “significant” step. He also took time to welcome Philadelphia International Medicine (PIM) to the TJB family, noting their commitment to provide medical support services at the relay to the athletes. PIM’s Marketing Director, Ms. Deborah Davis was introduced to the gathering. 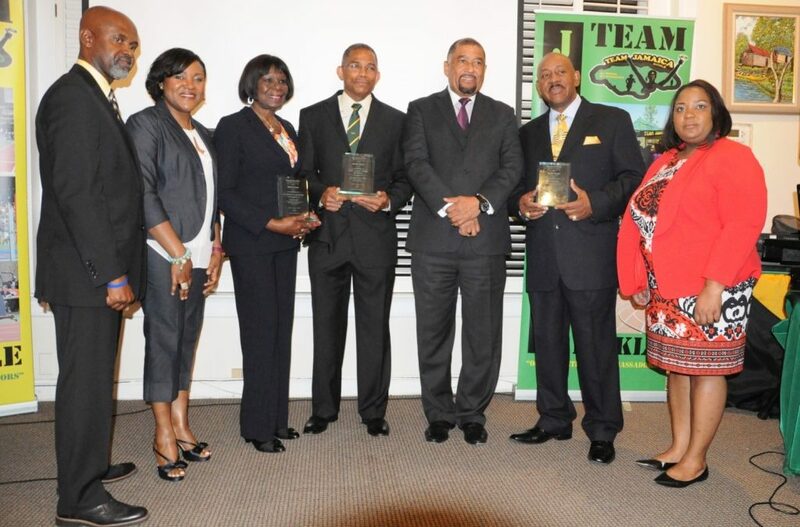 Olympian Karl ‘Laddy’ Smith, Executive Director and founder of the Washington based organization, Women at Real Risk (WARR), Mrs. Totlyn Taylor-Newby and President of the National Association of Jamaica and Rick Nugent of Supportive Organization (NAJASO), were honored by TJB for their humanitarian contribution to the Diaspora and Jamaica. Mistress of ceremonies for the evening was Dr. Clare Nelson a Jamaican stalwart in the DMV area and Founder and President of the Institute of Caribbean Studies, Washington D.C.
TJB thanks, Island Cuisine, Island Pride, Negril Eatery, Cakes by Damion, Jerk Pit, Metroplex Health & Nutrition Services, EMD Sales, Grace Foods and most importantly the Ambassador, Embassy and staff for their support of what was a successful event. The Penn Relays are, April 28-30. Team Jamaica Bickle may be reached at 718.523.2861 or teamjamaicabickle@gmail.com. By Social media: www.facebook.com/teamjamaicabickle; twitter handle: @teamjambickle.